David Coulthard will drive for Red Bull next season after signing a one-year extension to his contract. The 36-year-old's deal runs out at the end of the season but he has been retained despite only scoring points in one race so far this term. "My enjoyment remains absolute and my commitment to the team is 100% as well, so I'm looking forward to it," he said. Coulthard will be joined by Australian Mark Webber, who also returns for another season with the team. At 36, Coulthard is the oldest driver on the grid and has won 13 Grands Prix in his 13-year career. 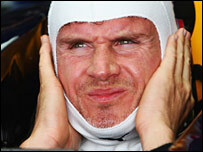 It will be Coulthard's fourth season with Red Bull after joining them from McLaren in 2005. "It was a new challenge when I started there to try to see if I could play my part in helping guide the team from the driving seat," said Coulthard. "Team boss Christian Horner has been busy with the recruitment side and the journey continues. "We have had a bit of a troubled year this year, but the pace has certainly improved. "Logically we'll be expecting to build on that through the course of the year and into next season." Horner said re-signing Coulthard had been a straight-forward decision. "We're very happy with the job that both our drivers are doing," he said. "We're in an evolution phase of Red Bull Racing and David's done a very good job in the three years that he's been with us."